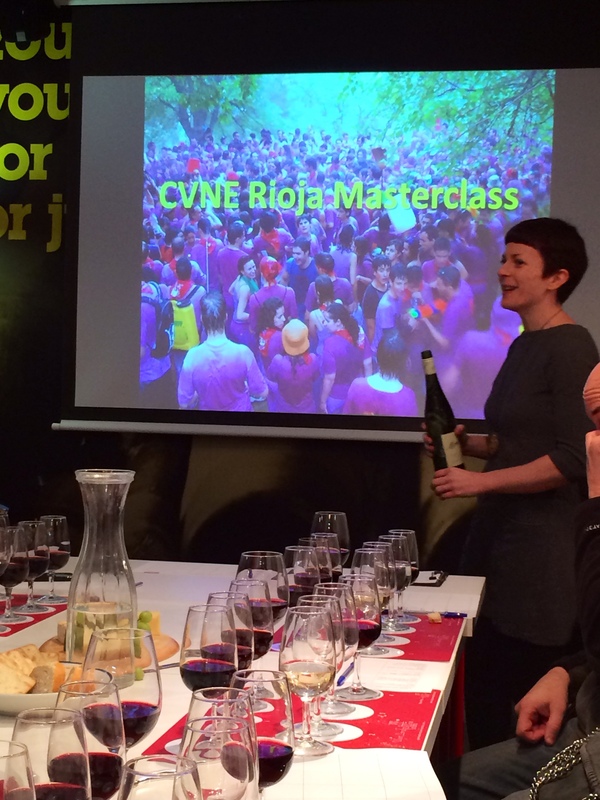 The CVNE Masterclass was held by the West London Wine School, one of my favorite places for wine tastings and courses in London. What I appreciate most about WLWS is the relaxed and easy going atmosphere at events, delicious cheeses to go with the wines, excellent value for money and last but not least the brilliant tutor Cherie who always makes the evenings at school great fun. 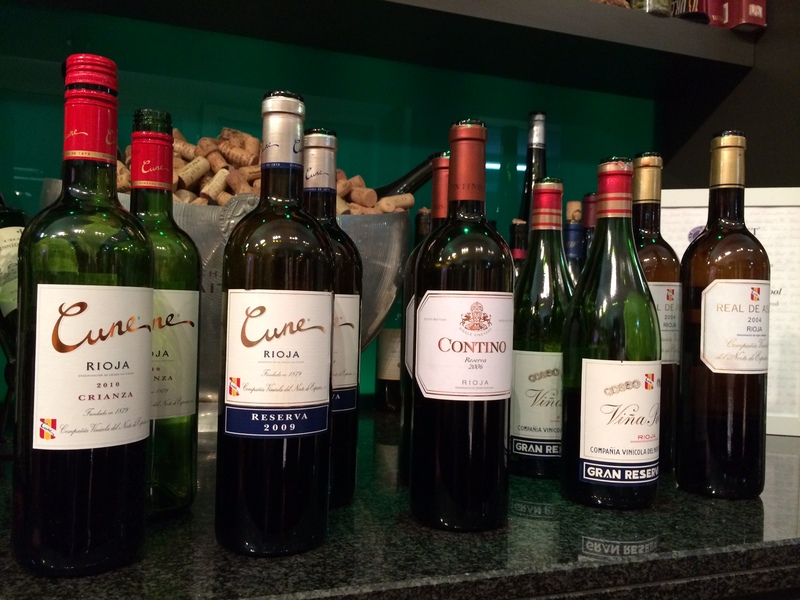 The line-up on the night was eight wines – three whites and five reds – all from the Rioja DOCa appellation. Please note that I have included suggested food pairings into the tasting notes below. 2013 CVNE Monopole Blanco: 100% Viura; price: £7-9. Pale lemon colour, medium+ intensity, light bodied, med+ acidity, very fruit forward, light and refreshing unoaked style. Citrus (lime, grapefruit), floral, peach, pear and tropical fruit aromas; med finish. This wine was my personal favourite white of the evening. A wine I would happily drink on a hot summer day as an aperitif or paired with Mediterranean cuisine, seafood and fish. 2013 Vina Real Blanco: 100% Viura, barrel fermented in new American oak for 15-20 days, price: £7-10. Mid-lemon colour, medium+ intensity, medium bodied with higher acidity levels. Crisp and refreshing with notes of lime, baked apple, orange peel, tropical fruit (pineapple), coconut and vanilla. Medium+ finish. I would love to try this wine with croquetas (my fav tapas dish! ), but it would also pair wonderfully with white meats like chicken, light pasta dishes and oily fish. 2011 Contino Blanco: 80% Viura, 15% Garnacha Blanca, 5% Malvasia, price: £23-26. Mid-deep lemon colour, med+ intensity, full bodied with medium acidity levels. Tropical fruit flavours, candied limes, nutty (almonds, walnuts), honey, coconut and vanilla. A complex and spicy wine with med+ finish. Due to its fuller body this wine would pair nicely with creamy pastas dishes, turkey or chicken tagine. 2010 Cune Crianza: 80% Tempranillo, 20% Garnacha & Mazuelo, price: £10. Matured in US oak for 1 year this wine is pale ruby in colour with medium- intensity, smooth medium- tannins and medium- body. Lots of spice aromas (pepper, clove, liquorice, vanilla), red fruit and violets. This wine should be drunk young and served lightly chilled, e.g. with a summer BBQ, light meat dishes or meaty fish. 2009 Cune Reserva: 85% Tempranillo, 15% Garnacha, Graciano & Mazuelo, price £11-17. Pale ruby with a tinge of garnet, med bodied, medium acidity levels, soft velvety tannins. Aromas of sweet spice, hint of smoke, leather, tobacco, bramble fruit, black currant. Complex wine with a long lasting finish. Serve with lamb, casseroles and other rich dishes. 2006 Contino Reserva: 85% Tempranillo, 10% Graciano, 5% Garnacha & Mazuelo, price ~ £24. Medium garnet colour, medium+ body with medium- acidity, very elegant wine with well integrated soft ripe tannins. Red and black fruit, sweet spice, dried fruit (fig, sultanas), coconut, leather, tobacco. Long finish. This wine is my personal favourite red and my overall winner of the night. Great with roasted dishes, meaty tapas and hard cheeses. 2007 Vina Real Gran Reserva: 95% Tempranillo, 5% Graciano, price ~ £22. Medium-deep garnet colour, medium+ intensity with medium+ body and medium acidity, silky tannins. Complex, warming and well balanced wine with sweet cherry aromas and sweet spice notes (cloves, cinnamon, nutmeg). Long finish. Another great partner for lamb, stews and hard cheeses. 2004 Cune Real de Asua: 100% Tempranillo, price ~ £51. Medium ruby with garnet tinge, pronounced intensity, full body and medium- acidity, ripe tannins. Black fruit (cassis, black cherry), mocha, sweet spice, dried fruit, earthy, herbal aromas, liquorice. Long finish. Pair with steak, lamb, meaty fish, e.g. monkish. This last wine was the most anticipated one of the evening and my expectations were obviously very high with the price of over 50 GBP. I have to admit, even though this undoubtedly is a very good wine with critic scores of 95/100 points, I cannot say I was swept of my feet. The main reason was the finish being of rather medium length and it thinned out a bit towards the end. This was also one of the reasons why my absolute winner of the night was the excellent 2006 Contino at half the price. If you are interested in purchasing any of the above wines please get in touch and I will be happy to help you source them. DID YOU KNOW? Have you ever wondered what the gold wire netting on some of the Rioja bottles is all about? Its purpose is to counteract fakes and the way it was designed makes it impossible to pull the cork without breaking the netting. Over time, it became fashionable and is now the feature of top Riojas.